The Gauls, when invaded by the Romans, had no method of hardening iron; at every blow their swords bended, so that they were obliged, before they could strike again, to put them under their foot or over their knee, to straighten them; and in most cases, before this could be done, their better armed foe had taken away their life! The edge of their sword was turned, so that they could not stand in battle; and hence the Gauls were conquered by the Romans. Adam Clarke, A Commentary and Critical Notes, (New York: Abingdon-Cokesbury Press, 1826), WORDsearch CROSS e-book, Under: “Psalm 89”. The Galatians began to see the benefits of supporting the Roman cause. So when the Roman general, Pompey, marched against Mithradates V, the Galatians were on Pompey’s side. In 64 b.c. Pompey rewarded their support by designating Galatia as a client kingdom and expanding its borders to include regions to the south and east. When in 36 b.c. Galatia was passed to Amyntas, the secretary and general of Deiotarus, the territory included portions of Pisidia and Phrygia. Later Amyntas acquired a large part of Lyconia and was given a section of Cilicia called Cilicia Tracheia and also much of Pisidia and Isauria by Augustus as a reward for his aid in the battle of Actium. 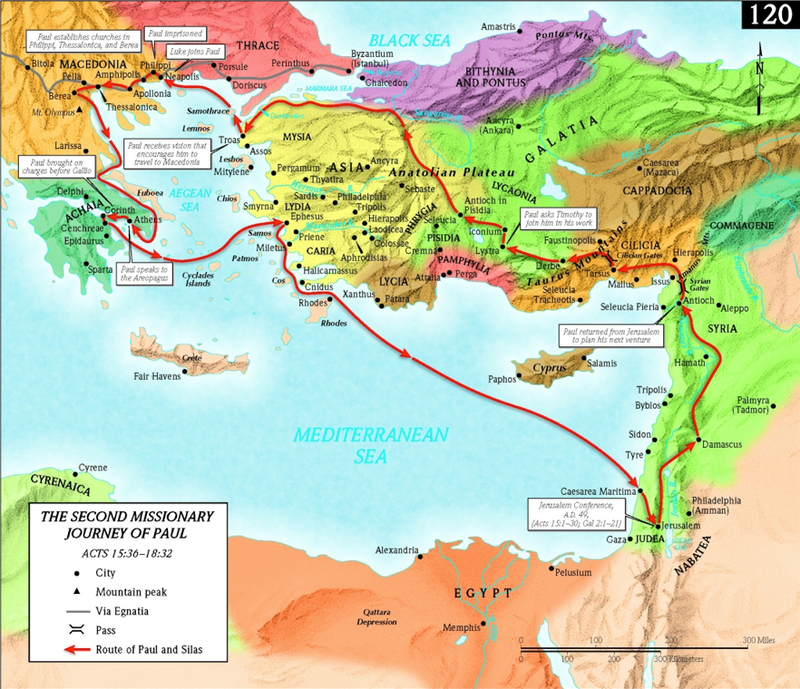 As a result the territory of Galatia included a large area in the southern part of Asia Minor that had never been ethnically Galatian. When Amyntas, the last king of Galatia, was killed in battle against the Homanadenses in 25 b.c., Augustus did not entrust the Galatian kingdom to the sons of Amyntas, but instead reorganized it as a Roman province under the authority of a Roman governor. Thus the Galatian kingdom became the Roman province of Galatia. Gerald F. Hawthorne, Ralph P. Martin, Daniel G. Reid, ed., Dictionary of Paul and His Letters, (Downers Grove, IL: InterVarsity Press, 1993), WORDsearch CROSS e-book, Under: “Galatians, Letter to The”. Located in what is now part of modern day Turkey, these Thracian descendents of Gaul are said to have had the Greek mythology ancestor of Thrax – a god who lived among them and who was a son of the Greek god of war Ares. Ares, we are told, is the son of of the Greek gods Zeus and Hera. Ares is also the lover of the Greek goddess Aphrodite. Why is this all important? So that when you read the text, you know who and what the biblical writer is addressing – the culture and history he is addressing – the kind of people he is addressing. practices a religion that has Animism in it know as Buddhism. Hinduism, Paganism, Neopaganism – are also all forms of Animism. Thomas Aquinas is held in high esteem by the Roman Catholic church without a doubt. He is one of many that considered that souls might exist in plants and animals which is Animism – Aristotle did too, among others. The Gauls, equally cruel in their worship, sacrificed men, originally to Eso and Teutate, but latterly to Mercury, Apollo, Mars, Jupiter, and Minerva. Caesar informs us that, whenever they thought themselves in danger, whether from sickness, or after any considerable defeat in war, being persuaded that unless life be given for life the anger of the gods can never be appeased, they constructed wicker images of enormous hulk, which they filled with men, who were first suffocated with smoke, and then consumed by fire. For this purpose they preferred criminals; but when a sufficient number of these could not be found, they supplied the deficiency from the community at large. Adam Clarke, A Commentary and Critical Notes, (New York: Abingdon-Cokesbury Press, 1826), WORDsearch CROSS e-book, Under: “Romans 9:27”. The Roman god Mercury was pictured on a dime in United States currency for 29 years. I used to drive a 1971 Mercury Cougar. Mercury the car company was also named after this Roman god. Do you see how all of this interweaves? Is syncretism a part of it? It would appear so, but I will leave the for you to research and decide because history is handed down and it is lived in new forms every single day based on the past. Sorry, I have digressed just a bit. Acts 15:40-41 (CJB) 40 However, Sha’ul chose Sila and left, after the brothers had committed him to the love and kindness of the Lord. 41 He went through Syria and Cilicia, strengthening the congregations. Acts 16:1 (CJB) 1 Sha’ul came down to Derbe and went on to Lystra, where there lived a talmid (disciple) named Timothy. He was the son of a Jewish woman who had come to trust, and a Greek father. Acts 16:6 (CJB) 6 They traveled through the region of Phrygia and Galatia, because they had been prevented by the Ruach HaKodesh (Holy Spriti) from speaking the message in the province of Asia. There is a long history here. Hopefully, I have given you a tiny glimpse of who the people are and what their background is so that you can better understand why Sha’ul wrote what he wrote and why he quoted the verses in the TaNaKh (Old Testament) that he did. When Sha’ul writes this letter, there has been damage done by those teaching a different gospel than he taught. Sha’ul addresses some of this. Sadly, there is a small faction in Messianic circles that are guilty of teaching a different gospel as well – one that centers on “legalistic observance of Torah commands” that Rabbi Sha’ul opposed. Sadly, there are some that do it in the Christian church as well. Galatians 3:6 (CJB) 6 It was the same with Avraham:“He trusted in God and was faithful to him, and that was credited to his account as righteousness.” Genesis 15:6 (CJB) 6 He believed in Adonai, and he credited it to him as righteousness. Galatians 3:11 (CJB) 11 Now it is evident that no one comes to be declared righteous by God through legalism, since“The person who is righteous will attain life by trusting and being faithful.” Habakkuk 2:4 (CJB) 4 “Look at the proud:he is inwardly not upright;but the righteous will attain lifethrough trusting faithfulness. Galatians 3:12 (CJB) 12 Furthermore, legalism is not based on trusting and being faithful, but on [a misuse of] the text that says,“Anyone who does these things will attain life through them.” Leviticus 18:5 (CJB) 5 You are to observe my laws and rulings;if a person does them,he will have life through them;I am Adonai. Galatians 3:13 (CJB) 13 The Messiah redeemed us from the curse pronounced in the Torah by becoming cursed on our behalf; for the Tanakh says,“Everyone who hangs from a stake comes under a curse.” Deuteronomy 21:22-23 (CJB) 22 (ii) “If someone has committed a capital crime and is put to death, then hung on a tree, 23 his body is not to remain all night on the tree, but you must bury him the same day, because a person who has been hanged has been cursed by God — so that you will not defile your land, which Adonai your God is giving you to inherit. Galatians 3:16 (CJB) 16 Now the promises were made to Avraham and to his seed. It doesn’t say, “and to seeds,” as if to many; on the contrary, it speaks of one — “and to your seed” — and this “one” is the Messiah.Galatians 3:19 (CJB) 19 So then, why the legal part of the Torah? It was added in order to create transgressions, until the coming of the seed about whom the promise had been made. Moreover, it was handed down through angels and a mediator. Genesis 12:7 (CJB) 7 Adonai appeared to Avram and said, “To your descendants I will give this land.” So he built an altar there to Adonai, who had appeared to him.Genesis 17:7 (CJB) 7 (vii) “I am establishing my covenant between me and you, along with your descendants after you, generation after generation, as an everlasting covenant, to be God for you and for your descendants after you.Genesis 17:7 (CJB) 7 (vii) “I am establishing my covenant between me and you, along with your descendants after you, generation after generation, as an everlasting covenant, to be God for you and for your descendants after you.Genesis 24:7 (CJB) 7 Adonai, the God of heaven — who took me away from my father’s house and away from the land I was born in, who spoke to me and swore to me, ‘I will give this land to your descendants’—he will send his angel ahead of you; and you are to bring a wife for my son from there. Galatians 4:27 (CJB) 27 for the Tanakh says,“Rejoice, you barren woman who does not bear children! Break forth and shout, you who are not in labor! For the deserted wife will have more children than the one whose husband is with her!” Isaiah 54:1 (CJB) 1 “Sing, barren woman who has never had a child! Burst into song, shout for joy,you who have never been in labor!For the deserted wife will have more childrenthan the woman who is living with her husband,” says Adonai. Galatians 5:14 (CJB) 14 For the whole of the Torah is summed up in this one sentence:“Love your neighbor as yourself”; Leviticus 19:18 (CJB) 18 Don’t take vengeance onor bear a grudge againstany of your people;rather, love your neighbor as yourself;I am Adonai. This entry was posted in Verses and tagged Adam Clarke, Animism, Aphrodite, Aristotle, battle of Allia, Brit Chadashah, Caesar, Christian, church, Circus Maximus, Ecclesiastes 1:9, Galatia, Galatians, Gallic, Gauls, Great Britain, Greece, Julius Caesar, legalism, legalistic observance of Torah commands, Mercury, Messianic, New Testament, Old Testament, paul, rabbi, Roman Catholic, Romans, Sha'ul of Tarsus, syncretism, Tanakh, Teutates, The Dictionary of Paul and His Letters, Thomas Aquinas, Thracian, Turkey, Visigoths. Bookmark the permalink. LIAR! LIAR! Pants on Fire!! !